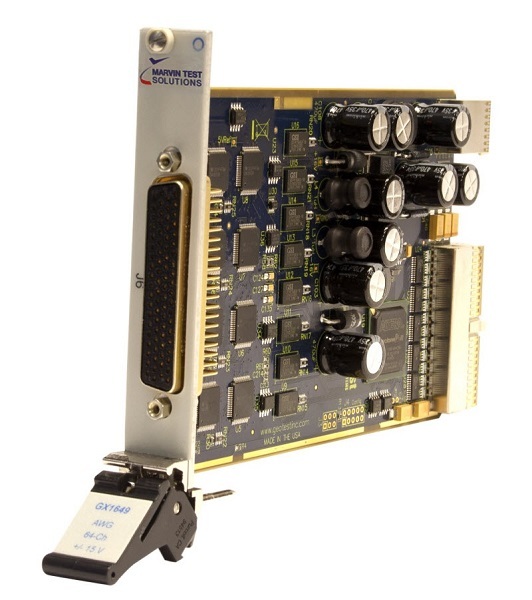 PXI Analog Output/Arbitrary Waveform Generator Card - GX1649 | Marvin Test Solutions, Inc. The GX1649 is a 3U PXI digital to analog output board designed specifically for applications where multiple DC or AC analog outputs are required. The GX1649 offers 64 output channels with 16-bits of precision signal sourcing performance and can be used as a DC source or arbitrary waveform generator. The GX1649 is organized into four groups of sixteen channels, providing up to 64 channels of AWG or DC source capability. For DC operation, each group can be programmed and triggered independently. All groups can be updated simultaneously and each channel within a group can be programmed to a unique voltage. When used as a waveform generator, 256 K of sample memory is allocated to each group of sixteen channels with the user being able to allocate the memory for one or all channels. With all 64 channels congfigured for AWG mode, the maximum sample rate is 625 KS/s. Each group can be clocked independently via a programable clock source or all groups can be clocked by by common source. Within any goup, channels can be configured for a combination of AWG and DC operation. For applications that require the continuous data transmission from the PC, the GX1649-1 supports data streaming, which allows continuous transmission of data from the PC to the GX1649's 1 K FIFO memory. Actual data streaming data rate will be dependent on the processor's speed and other processes that may be running concurrently. The GX1649 also offers 8 digital TTL I/O channels for general purpose applications. These digital I/O channels also can be used as external clock inputs for each of the 4 channel groups. The board is supplied with the GXAO software package which includes a virtual instrument panel, a Windows 32/64-bit DLL driver library and documentation. The virtual panel can be used to interactively program and control the instrument from a window that displays the instrument’s settings and status. In addition, interface files are provided to support programming tools and languages such as ATEasy, LabView, LabView/Real-Time, C/C++, Microsoft Visual Basic®, Delphi, and Pascal. Help file and PDF User's Guide provides documentation that includes instructions for installing, using and programming the board. Digital I/O Channels 8, each configurable as input or output.